Income-based residential segregation is becoming worse in metropolitan cities across the United States due to an increase in income divide between low and high-income households. Low-income households choose where they live based on income and cost of housing. They cannot move out of poor neighborhoods without the help of subsidized housing. This makes affordable housing the most likely avenue for alleviating residential segregation. 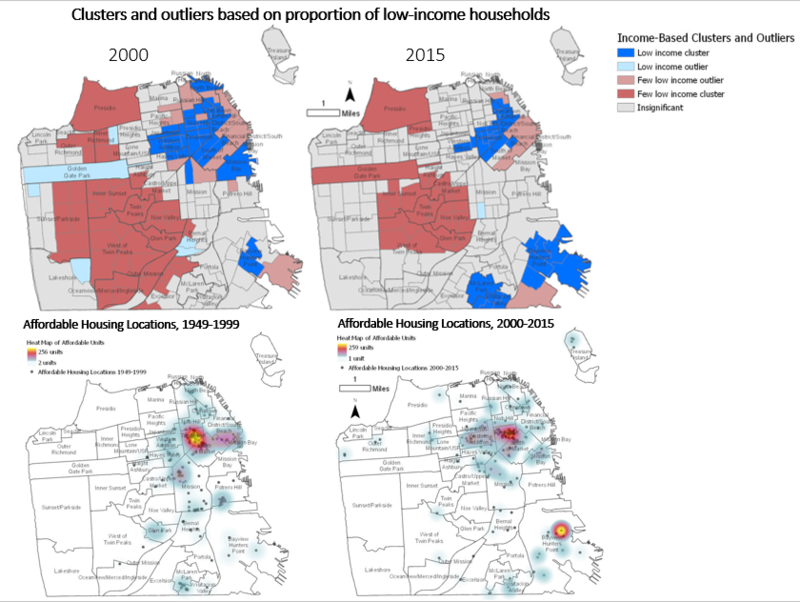 Using San Francisco as a case study, this research attempts to determine the relationship between affordable housing and income-based segregation and assess how residential segregation has changed from 2000 to 2015. There is a statistically significant relationship between affordable housing, income and segregated, low-income census tracts. The low-income population has shifted from the downtown area in 2000 to the downtown and southeastern area in 2015. The low-income population has less access to transit hubs, jobs and city amenities. Overall, the low-income population has become more segregated since 2000.